My apologies to Mission Beach, CA - that's where I picked up this magnet while in town for a friend's wedding. 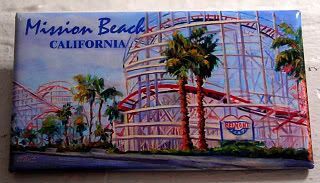 I totally know the diff between them and Santa Monica, but I already used the Santa Monica magnet I have! If you've read any of the cuteboy magnetposts in the last 586 magnets, you'll know that I pretty much have a TVboyfriend for everything. Up to, and including a weatherman crush. I know it's weird. But honestly. I collect magnets, didn't you hear? A crush is totally inbounds. Besides, it's not like a real crush. You know how they talk about how people feel like they know soap stars because they're "in your living room every day"? That's kinda how I feel about Dave. I've been watching David Marshall Price pretty much every weekday morning for almost than a decade now, ever since he was the weatherman for our local Fox morning show, Good Day New York. I remember when Fox produced the "Find a Girlfriend for Dave" segments - where he'd pick these chicks here in NYC, and go out with them. With the cameras following them. And then they'd dissect the dates during the show. A little odd. And a little annoying that they'd exploit the single guy that way. I also remember when he was looking for a dog, and he wasn't sure if he wanted to get one, and in the end, he rescued a Golden Retriever. And named him Chance (the weatherdog)! C'mon, that's adorable! So, when Dave headed to CBS for the local early show and then the CBS network (national!) weatherman gig, I was seriously thrilled for him. Which is crazy, because I've never met the guy. Which is crazier, because really, I'm in NYC, and if I wanted, I could see the guy every day at CBS Plaza. As it is, I've only been there once since he started...and that was only because a client was appearing on the show. Anyway, the Early Show is starting a new series for Dave, No Way Home, where I'm sure Maggie will mock him ruthlessly as she always does. Tomorrow, they're dropping Dave off in Santa Monica, with a jacket, backpack, cell phone, Blackberry (product placement? ), $50 and a GPS bracelet to track him. (in case the camera crews lose him?) He then has to make his way home to New York, through his own ingenuity and on the kindness of strangers. He'll be reporting, blogging and Tweeting along the way as well. I won't lie, I'm thoroughly fascinated by how he's gonna get home, and I've already RSS'd the production blog for the series. Good luck, David Marshall Price! Get home safe! "If you've read any of the cuteboy magnetposts in the last 586 magnets,"
But you don't have a cuteboy tag on the blogposts! Idea! Also, I recorded my reaction as both funny and dorky. It's funnily dorky. When did you start using the "reaction" feedback? I know, I've been trying to rethink all my labels. Because I don't need collecting magnets, magnets, magnet collecting in every tag. But, I feel like "cuteboy" might actually be every other post, which would be just as bad. Heh. Thanks for the feedback. I added in the reactions a while ago, though you can select your own reactions, and I liked using dorky. Heh. IMO, "cuteboy" is a vitally important tag. Even if it is every other post. I agree. There should absolutely be a cuteboy tag. maybe i'll follow his twitter. i don't even like the guy... but i like that his dog is named chance. who will be watching his puppy while he's finding his way home???? i will!